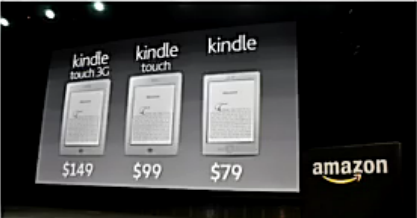 Something called 'X-Ray' mode to show the "bones of the book"
There is a $79 no-touch Kindle too, with buttons. It is 18% smaller too. It is shipping today. EDIT: This will have Special Offers. There is a new advert for the $79 Kindle now. Jeff Bezos is now talking about their media business and Android app store. This could mean a Kindle tablet. EDIT: Kindle Fire is the tablet. It will cost $199. 7" tablet, dual-core CPU. Edge-to-edge screen. It looks like the BlackBerry PlayBook. There will be apps, movies, magazines, books and a lot more. It is light enough to be held in a hand. All data is backed up in the cloud. There are bookmark features that will let you watch movies on your TV and then move to your tablet. It does multitasking. There are no buttons on the front. 169 ppi, Gorilla Glass is there. No idea what version of Android this runs. Amazon's Silk browser on the Kindle Fire runs on some sweet technology. Most of the work is done on Amazon's servers. Parts of pages are cached on the device, learning from your habits. The Kindle Fire will come on November 15, pre-orders open. I will be updating this rapidly. Keep pressing F5. Amazon is not discontinuing the previous generation of Kindles yet. They are calling it 'Kindle Keyboard' now.